Aside from Li she cites Stephen Sondheim, Andrew Lloyd Webber, The Beatles and Led Zeppelin as early inspirations, with Joni Mitchell’s “Blue” album being especially pivotal. Today she also adds more modern female folkrans like Neko Case, Laura Veirs, and Brandi Carlile If forced to describe the sound of Vesper, she would call it modern ABBA, she says with a laugh. Zachary would call it earnest pop music, and says he usually compose tracks alongside animated movies or episodes of the nature documentary series Planet Earth on mute. 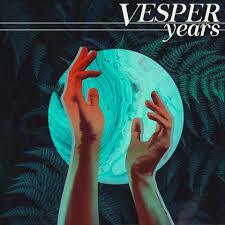 Vesper’s “Years” “tackles heavy subjects but does it in a digestible way,” as Zachary puts it, and they liked the idea that the video to “I Wait” showing their “goofy side,” and they agree it’s a unique approach to a 2019 pop tune. Without further ado, check out the video below, go to Vesper’s website or visit them on Facebook to hear more of the record and pick it up if you like it, and maybe the band will see you at their record release show at The Empty Bottle on Tuesday night! Previous entry: The Fourth Wall: Can You Ever Forgive Me?